The Irish Free State was an independent state established in 1922 under the Anglo-Irish Treaty of December 1921. 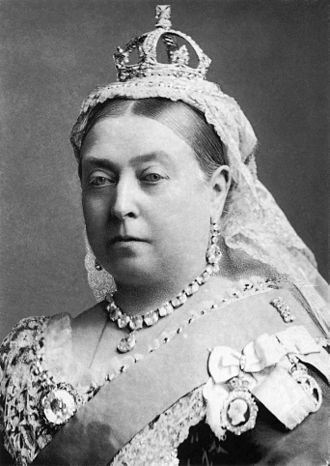 That treaty ended the three-year Irish War of Independence between the forces of the self-proclaimed Irish Republic, the Irish Republican Army, and British Crown forces, the Free State was established as a Dominion of the British Commonwealth of Nations. It comprised 26 of the 32 counties of Ireland, Northern Ireland, which comprised the remaining six counties, exercised its right under the Treaty to opt out of the new state. W. T. Cosgrave, who had led both of these governments since August 1922, became the first President of the Executive Council, the legislature consisted of Dáil Éireann and Seanad Éireann, known as the Senate. Members of the Dáil were required to take an Oath of Allegiance, the oath was a key issue for opponents of the Treaty, who refused to take the oath and therefore did not take their seats. Pro-Treaty members, who formed Cumann na nGaedheal in 1923, held a majority in the Dáil from 1922 to 1927. In the first months of the Free State, the Irish Civil War was waged between the newly established National Army and the anti-Treaty IRA, who refused to recognise the state. The Civil War ended in victory for the government forces, with the anti-Treaty forces dumping its arms in May 1923, the anti-Treaty political party, Sinn Féin, refused to take its seats in the Dáil, leaving the relatively small Labour Party as the only opposition party. In 1926, when Sinn Féin president Éamon de Valera failed to have this policy reversed, he resigned from Sinn Féin, Fianna Fáil entered the Dáil following the 1927 general election, and entered government after the Irish general election,1932, when it became the largest party. De Valera abolished the Oath of Allegiance and embarked on a war with Britain. In 1937 he drafted a new constitution, which was passed by a referendum in July of that year, the Free State came to an end with the coming into force of the new constitution on 29 December 1937. Under the new constitution the Irish state was named Ireland, opposition increased to Irelands participation in World War I in Europe and the Middle East. This came about when the Irish Parliamentary Party supported the Allied cause in World War I in response to the passing of the Third Home Rule Bill in 1914. Many people had begun to doubt whether the Bill, passed by Westminster in September 1914 but suspended for the duration of the war, Sinn Féin, the Irish Party and all other Nationalist elements joined forces in opposition to the idea during the Conscription Crisis of 1918. 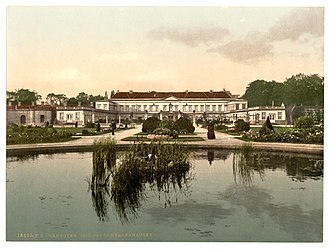 At the same time the Irish Parliamentary lost in support on account of the crisis, Irish republicans felt further emboldened by successful anti-monarchical revolutions in the Russian Empire, the German Empire, and the Austro-Hungarian Empire. The Sinn Féin party, founded by Arthur Griffith in 1905, had espoused non-violent separatism, under Éamon de Valeras leadership from 1917, it campaigned aggressively and militantly for an Irish republic. On 21 January 1919, Sinn Féin MPs, refusing to sit at Westminster, assembled in Dublin and it affirmed the formation of an Irish Republic and passed a Declaration of Independence, the irish people is resolved. The royal coat of arms of the United Kingdom, or the Royal Arms for short, is the official coat of arms of the British monarch, currently Queen Elizabeth II. These arms are used by the Queen in her capacity as monarch of the United Kingdom. Variants of the Royal Arms are used by members of the British royal family. In Scotland, there exists a version of the Royal Arms. The crest is a statant guardant lion wearing the St Edwards Crown, the dexter supporter is a likewise crowned English lion, the sinister, a Scottish unicorn. According to legend a free unicorn was considered a dangerous beast, therefore the heraldic unicorn is chained. In the greenery below, a thistle, Tudor rose and shamrock are depicted, motto Dieu et mon Droit in the compartment below the shield, with the Union Rose and Thistle engrafted on the same stem. The Royal Arms as shown above may only be used by the Queen herself and they appear in courtrooms, since the monarch is deemed to be the fount of judicial authority in the United Kingdom and law courts comprise part of the ancient royal court. Judges are officially Crown representatives, demonstrated by the display of the Royal Arms behind the bench in all UK courts. In Northern Ireland, the Royal Arms cannot be displayed in courtrooms or on court-house exteriors and they may be shown on the exterior of court buildings that had them in place prior to the 2002 law. 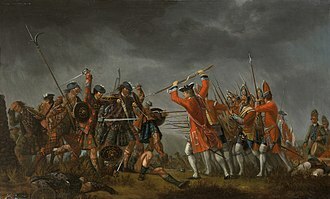 However, when used by the government and not by the monarch personally and this is the case with the sovereigns Scottish arms, a version of which is used by the Scotland Office. The Royal Arms have regularly appeared on the produced by the Royal Mint including, for example, from 1663, the Guinea and, from 1983. In 2008, a new series of designs for all seven coins of £1 and below was unveiled by the Royal Mint, the monarch grant Royal Warrants to select businesses and tradespeople which supply the Royal Household with goods or services. This entitles those business to display the Royal Arms on their packaging and it is customary for churches throughout the United Kingdom whether in the Church of England or the Church of Scotland to display the Royal Arms to show loyalty to the Crown. 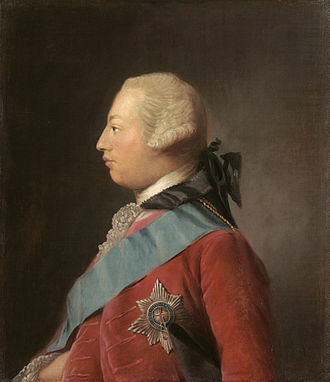 Prince George of Denmark and Norway, Duke of Cumberland, was the husband of Queen Anne, who reigned over Great Britain from 1702. 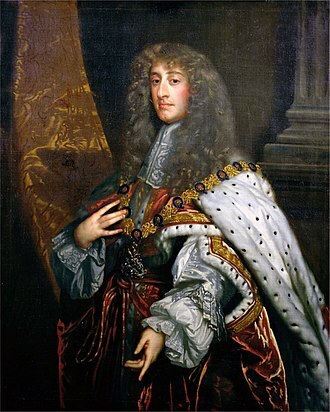 His marriage to Anne was arranged in the early 1680s with a view to developing an Anglo-Danish alliance to contain Dutch maritime power, as a result, George was unpopular with his Dutch brother-in-law William of Orange, who was married to Annes elder sister, Mary. 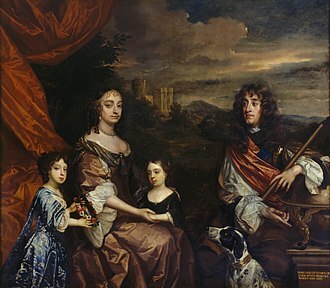 William and Mary became joint monarchs of Britain, with Anne as their heir presumptive, in 1689 after the Glorious Revolution deposed James II and VII, the father of both Anne and Mary. William excluded George from active service, and neither George nor Anne wielded any great influence until after the deaths of William and Mary. During his wifes reign, George occasionally used his influence in support of his wife and he had an easy-going manner and little interest in politics, his appointment as Lord High Admiral in 1702 was largely honorary. 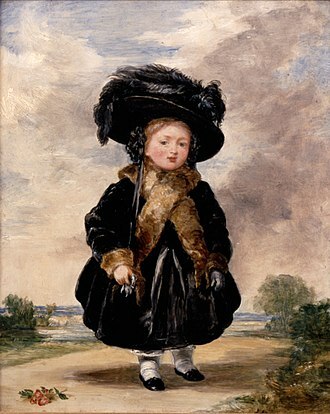 Annes seventeen pregnancies by George resulted in twelve miscarriages or stillbirths, four infant deaths, and a sick son, William. Despite the history of their children and Annes marriage was a strong one, George died aged 55 from a recurring and chronic lung disease, much to the devastation of his wife, and he was buried in Westminster Abbey. George was born in Copenhagen Castle, and was the son of King Frederick III of Denmark and Norway. His mother was the sister of Ernest Augustus, Duke of Brunswick-Lüneburg, from 1661, his governor was Otto Grote, Hanoverian minister to Denmark. 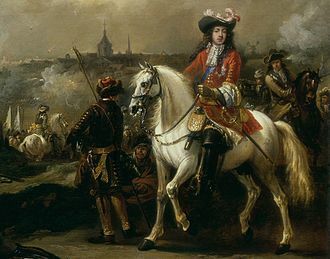 Grote was more courtier and statesman than educator and when he left for the Hanoverian court in 1665, George received military training, and undertook a Grand Tour of Europe, spending eight months in 1668–69 in France and mid-1669 in England. His father died in 1670, while George was in Italy and he travelled through Germany again in 1672–73, to visit two of his sisters, Anna Sophia and Wilhelmine Ernestine, who were married to the electoral princes of Saxony and the Palatinate. In 1674, George was a candidate for the Polish elective throne, Georges staunch Lutheranism was a barrier to election in Roman Catholic Poland, and John Sobieski was chosen instead. 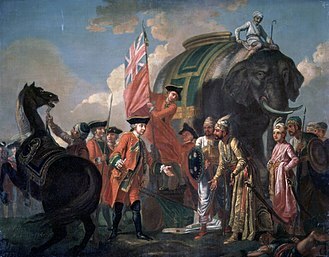 In 1639, a series of English fortresses on the Indian coast was initiated with Fort St George. 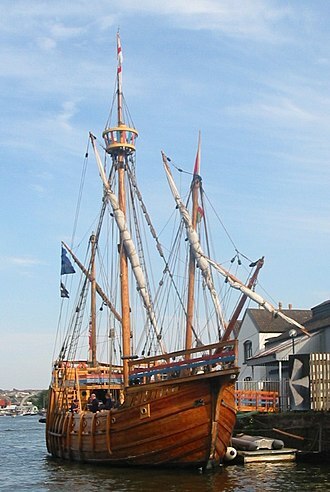 In North America and Virginia were the first centres of English colonization, as the 17th century wore on, Plymouth, New Hampshire, Massachusetts Bay, New Scotland, New Haven and Rhode Island and Providence were settled. In 1664, New Netherland and New Sweden were taken from the Dutch, becoming New York, New Jersey, the Kingdom of England is generally dated from the rule of Æthelstan from 927. 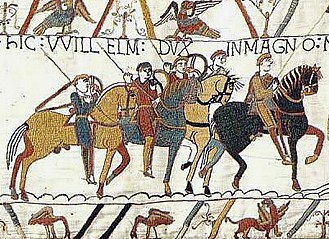 During the rule of the House of Knýtlinga, from 1013 to 1014 and 1016 to 1042, in 1066, William the Conqueror, Duke of Normandy, conquered England, making the Duchy a Crown land of the English throne. 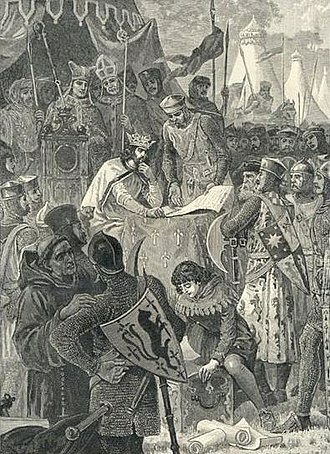 Through the remainder of the Middle Ages the kings of England held extensive territories in France, under the Angevin Empire, England formed part of a collection of lands in the British Isles and France held by the Plantagenet dynasty. 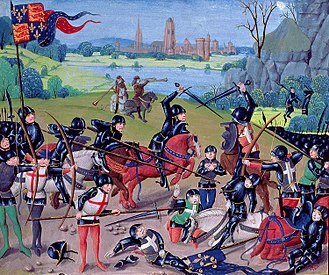 The collapse of this dynasty led to the Hundred Years War between England and France, at the outset of the war the Kings of England ruled almost all of France, but by the end of it in 1453 only the Pale of Calais remained to them. 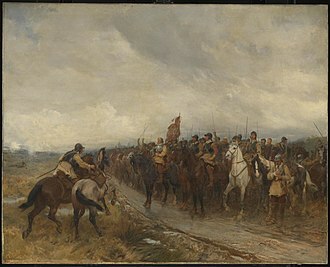 Calais was eventually lost to the French in 1558, the Channel Islands, as the remnants of the Duchy of Normandy, retain their link to the Crown to the present day, Other early English expansion occurred within the British Isles. 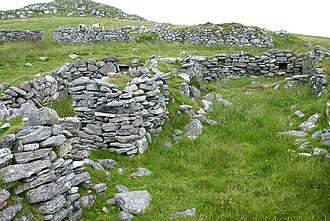 As early as 1169, the Norman invasion of Ireland began to establish English possessions in Ireland, as a result of this the Lordship of Ireland was held for centuries by the English monarch, although it was not until the early 17th century that the Plantation of Ulster began. English control of Ireland fluctuated for centuries until Ireland was incorporated into the United Kingdom of Great Britain, the voyages of Christopher Columbus began in 1492, and he sighted land in the West Indies on 12 October that year. Cabot sailed in 1497, successfully making landfall on the coast of Newfoundland, there, he believed he had reached Asia and made no attempt to found a permanent colony. He led another voyage to the Americas the following year, the Reformation had made enemies of England and Spain, and in 1562 Elizabeth sanctioned the privateers Hawkins and Drake to attack Spanish ships off the coast of West Africa. 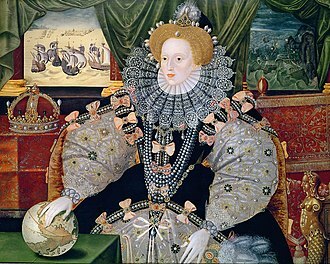 Later, as the Anglo-Spanish Wars intensified, Elizabeth approved further raids against Spanish ports in the Americas, the influential writers Richard Hakluyt and John Dee were beginning to press for the establishment of Englands own overseas empire. 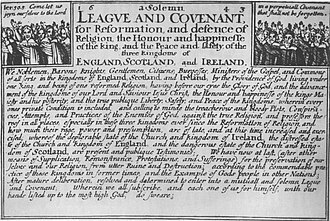 The first serious attempts to establish English colonies overseas were made in the last quarter of the 16th century, the 1580s saw the first attempt at permanent English settlements in North America, a generation before the Plantation of Ulster. 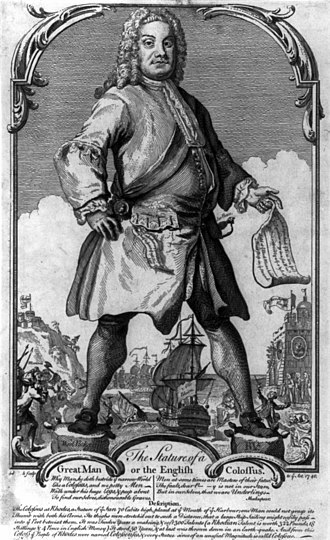 Soon there was an explosion of English colonial activity, driven by men seeking new land, by the pursuit of trade, in the 17th century, the destination of most English people making a new life overseas was in the West Indies rather than in North America. Financed by the Muscovy Company, Martin Frobisher set sail on 7 June 1576, from Blackwall, London, in August 1576 he landed at Frobisher Bay on Baffin Island and this was marked by the first Church of England service recorded on North American soil. Frobisher returned to Frobisher Bay in 1577, solemnly taking possession of the side of it in Queen Elizabeths name. Elizabeth Stuart was, as the wife of Frederick V, Elector Palatine, Electress Palatine, and briefly, Queen of Bohemia. 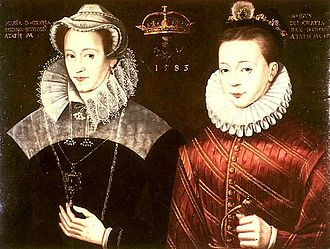 Due to her husband’s reign in Bohemia lasting for just one winter and she was the second child and eldest daughter of James VI and I, King of Scots and Ireland, and his wife, Anne of Denmark. 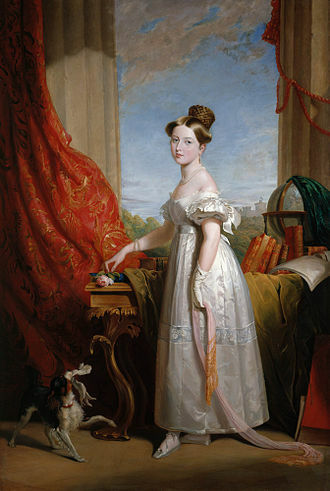 She was the granddaughter of Mary, Queen of Scots and she was four years older than her brother Charles, who became Charles I of England and Ireland. 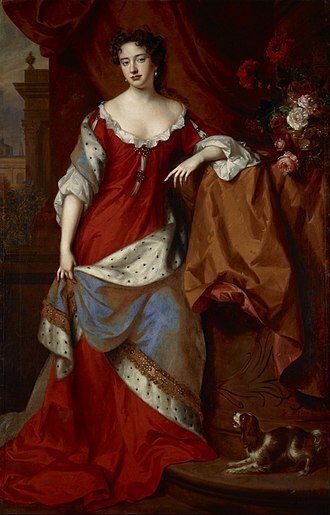 With the demise of the Stuart dynasty in 1714, her grandson succeeded to the British throne as George I of Great Britain, the reigning British monarch, Elizabeth II, is Elizabeth Stuarts direct descendant of the 10th and 11th generation through different paths. 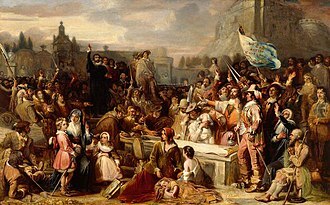 Elizabeth was born at Falkland Palace, Fife, on 19 August 1596 at 2 oclock in the morning, at the time of her birth, her father was King of Scots only. Named in honour of Queen Elizabeth I of England, the young Elizabeth was christened on 28 November 1596 in the Chapel Royal at Holyroodhouse, a couple of years the kings second daughter, was placed in their care as well. 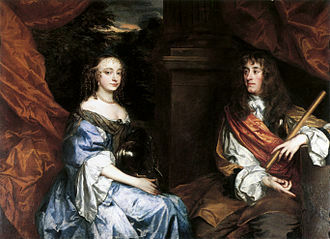 Elizabeth did not pay attention to this younger sister, as even at this young age her affections were with her brother. When Elizabeth I, the Queen of England, died in 1603, Elizabeth Stuarts father, along with her elder brother, Elizabeth made the journey south toward England with her mother in a triumphal progress of perpetual entertainment. Elizabeth remained at court for a few weeks, but there is no evidence that she was present at her parents coronation on 25 July 1603 and it seems likely that by this time the royal children already had been removed to Oatlands, an old Tudor hunting lodge near Weybridge. On 19 October 1603 an order was issued under the privy seal announcing that the King had thought fit to commit the keeping and education of the Lady Elizabeth to the Lord Harrington and his wife. 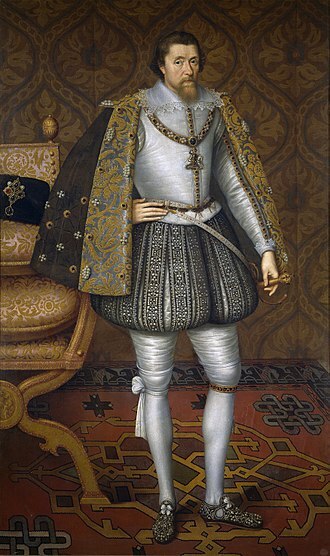 Under the care of Lord Harington at Coombe Abbey, Elizabeth met Anne Dudley, the conspirators chose Elizabeth after considering the other available options. 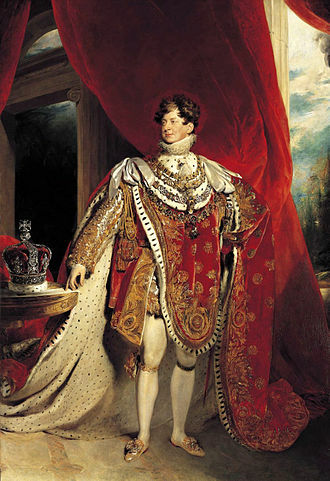 Prince Henry, it was believed, would perish alongside his father, Charles was seen as too feeble and Mary too young. St John the Baptist Church, Hagley, memorial to Meriel Lyttelton (a daughter of Thomas Bromley) from 1769, remembered "for Breeding up her Children in the Protestant Religion, Their Ancestors having been Papists"
a Kick at the Broad-Bottoms!, shows King George III exclaiming "what! what! bring in the Papists!". James Gillray, 1807.